Hooray, hooray the greenhouse is done. I’ve dug and turned over the claggy clay to a spade’s depth and removed a big tub of bramble roots and buttercups. To enrich it a bit and have it completely ready for swathes of tomatoes I’ve added a few bags of rotted manure, some lime, some supagro and a bale of compost and then covered it all till planting time in case I’ve missed some ‘orrible weedlings. Remembered afterwards that lime and manure aren’t really supposed to go in together. Ah well. While digging I saw not one worm and the soil smelled very metallic. Hopefully not a bad sign…I think Phil only ever grew in pots in there (my greenhouse is pretty much on the same footprint). What I did find deep in the earth (and, miraculously, did not kill with the spade!) were 2 stag beetle larvae, now rehomed, one deep in a woodchip path and the other in a rotting pile of wood and hopefully both will survive into beetlehood. It was really blustery today. 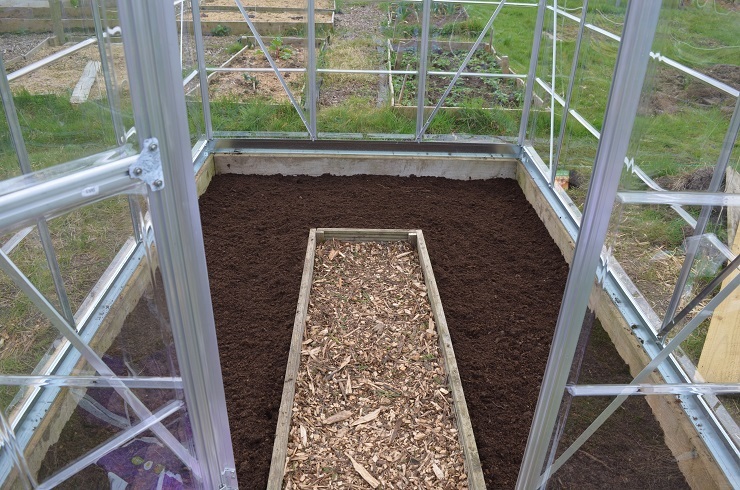 A sudden gust took the greenhouse window off and sailed it over to the edge of the plot. The arm thingy really is shoddy quality – though I keep telling myself that for £35 it’s still a complete bargain. My autovent arm should arrive tomorrow and I will be up Tuesday morning to fix it on. The other bits and pieces have all arrived – the t-bolts with rings in are much smaller than I thought they would be, but I’ve got some S-hooks to use with them for horizontal bamboo cane supports. The space is already starting to fill up and I’m very grateful for Alan’s offer of some spare staging – you’re a proper gent, thank you. Learned over the weekend that spuds are rubbish on #92 because of wireworm, so that’s me back to plan A of spuds on #100. When it eventually dries out. I don’t remember it being quite so wet last year and that was wall to wall rain for months. I did get the Desirees and 2 short rows of Charlottes into the blue bed. It’s the same bed as I used for spuds last year, but I will just have to risk it. The other beds aren’t ready. The green bed with Lady Christls is horribly claggy so I’ll leave that another week before adding more Charlottes. Filled 2 spud bags with compost and added 3 Lady Christls and 3 Charlottes. Note to self: they should be ready w/c 29 June and w/c 13 July respectively. The Desirees should be ready around 7th Sept. The salsify looks like they are getting ready to flower: they suddenly have lots more foliage. 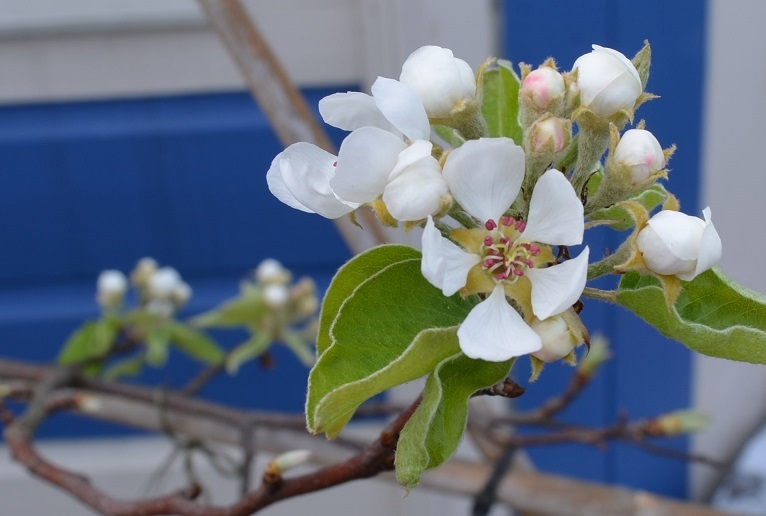 And all of the fruit is blossoming – my pear trees are flowering for the first time, which is very exciting. The apple tree has flower buds too this year and I need to read up on how to break biennial bearing habits as there were none last year. 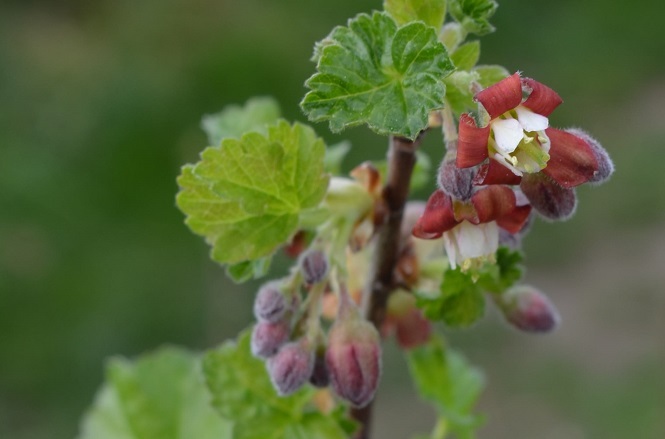 The jostaberry also has beautiful flowers on. My sole surviving overwintered chilli could also be about to burst forth. Gave away about 30 strawberry runners and 2 spare young blackcurrant bushes. I have been promised cake in return… Yum! Potted on: BNS, Marina di Chioggia x 2, Potimarron x 4, and in the greenhouse: tomatilloes, Genovese courgettes, Shishigatani squash. Pinched out the sweet peas because Monty said to on Gardener’s World – am obviously easily influenced and I uprooted one in my enthusiasm. The seed circle Minidor DFB are up in record time and will go to the greenhouse v. soon. The sun’s nearly too high to shine into flat windows now.